A lot of the characters in this play wear aprons. 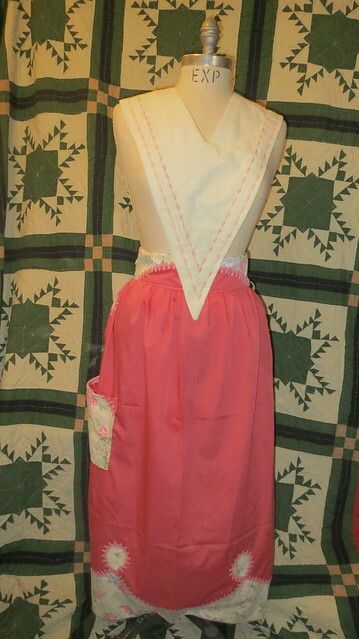 I think I will be making over nine aprons for the play some will be pinafore like. The three in this post are for Hanna the servant and family friend. 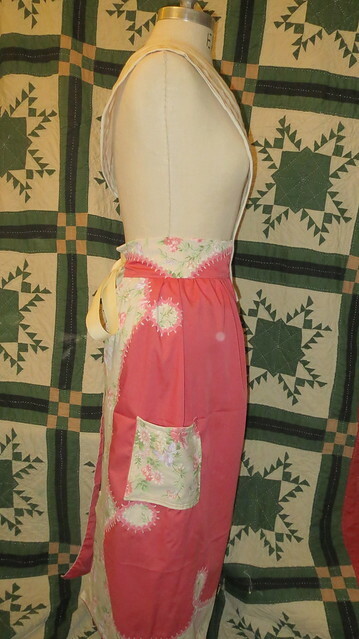 She is supposed to have four aprons but I have not made the last one yet. These aprons I am purposely re-purposing old items as the March family and Hanna are not supposed to have money for new things. So these are made out of old faded bed sheets a few have little holes in them and so on. 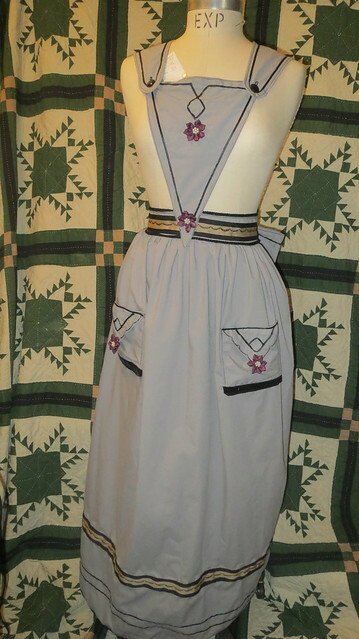 The gray apron is the first one the character Hanna will wear. It is meant to be reminiscent of the military stripes the men wear. 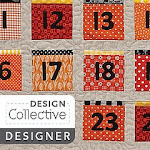 It is made from a gray sheet that had zero embellishments on it. 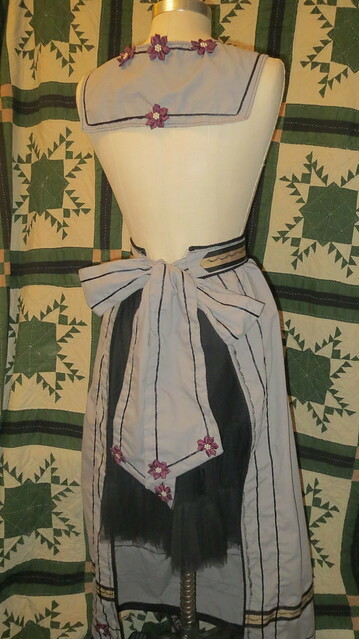 The ribbon i used at the waist and hem was a piece of gross grain two toned ribbon I saved from a gift someone gave me. There is velvet ribbon on the pockets same ribbon used for Jo's red dress from Act 1. The black cord you see is southache braid again. The buttons on the collar are antique jet buttons and true to period. The flowers you see are made out of double sided satin ribbon with 7 bead centers. 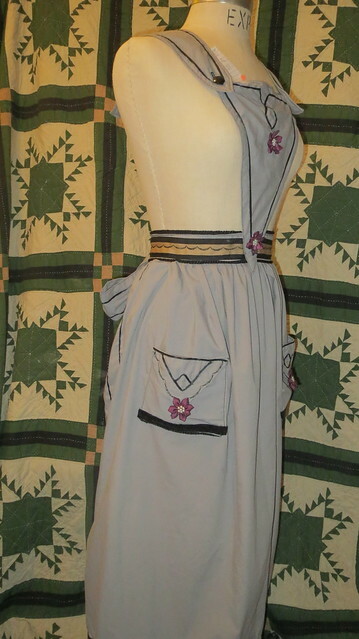 I am giving each apron at least 1 pocket some two so that the actors have places to put props they will use on stage like unlit candles and handkerchiefs and things of that sort. Usually in a play you do not put your backside to the audience,. 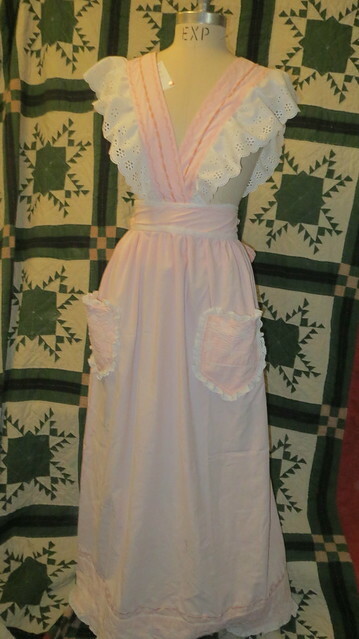 But just in case that happens I wanted the back to be just as interesting as the front on the aprons sometimes more so. The next apron my children have named the valentine apron. I guess with that day so close it is on their minds. To me it is just sickly sweet. 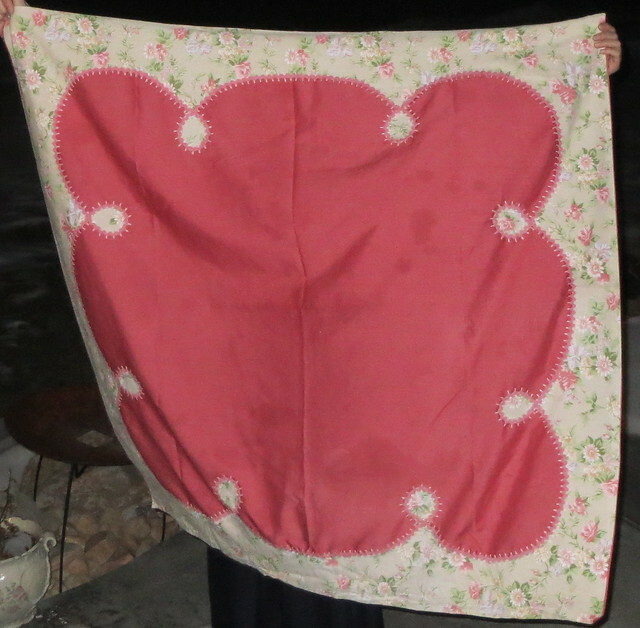 The sheet I made this from already had white embroidery on it. 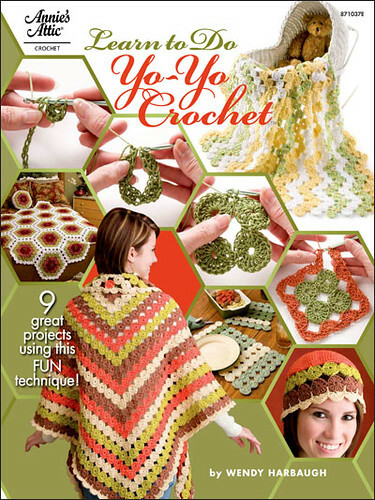 So I used that on the pockets and hem. Then I added machine embroidery to the straps and ties to add just a little more I also added it to the hem to pull the top and bottom together more. The waistband is stiffened with some pellon that I found a large bolt of a few years back while thrift shopping the bolt has over 100yards on it not bad for 5 bucks I don't even think I have used 25 yards of it yet. 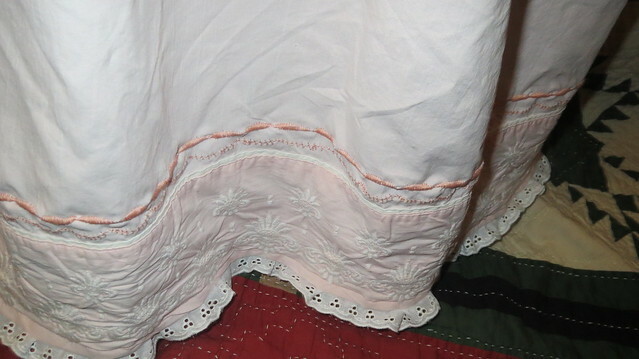 The eyelet lace around the straps is the same i used on a pair of pantalets that I have already shown. The little eyelet lace came from a friend the same one that gave me all the fringe I am am using but it was a different day that she gave me this lace. I ended up using all I had left except 6 inches worth. 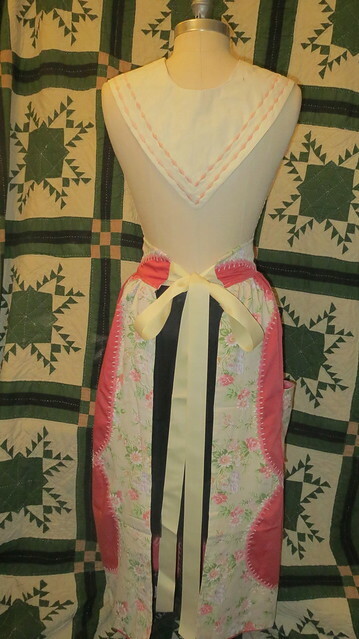 I think this apron may be a little long if it is I will add a growth pleat to the dress to take up a few inches in length. 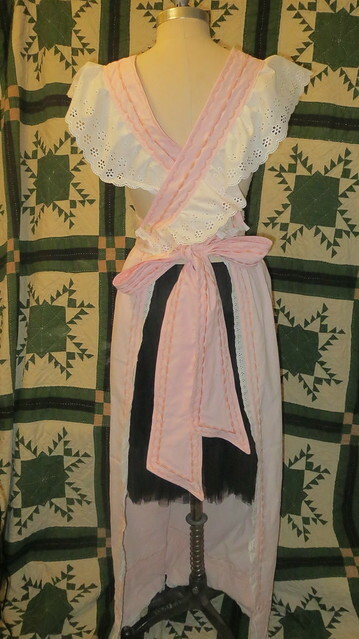 The Salmon colored one is made from an old table cloth I found yesterday thrift shopping for 2 dollars. I know it sound strange but I like that it was faded and old and yes hand made ( yes I cut it up). I think it was originally from the 1940's ish. It had old stains all over it from where food had been spilled over the years of use. I washed them up I don't mind stains in fact I prefer them for this but I do not want dirt and other such stuff on them so the sheets and table cloth got cleaned and then set to work on cutting them all apart. 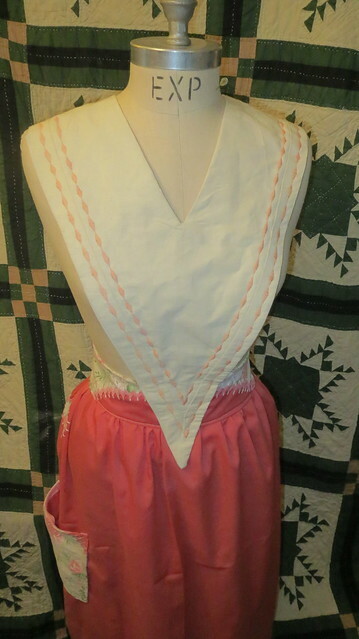 The bib for the salmon colored apron was left over from a sample I had to make about a year back for a school concert choir. We had run out of choir rob collars so I had to draft a pattern and this was the mock up. The actual collars are red and white. 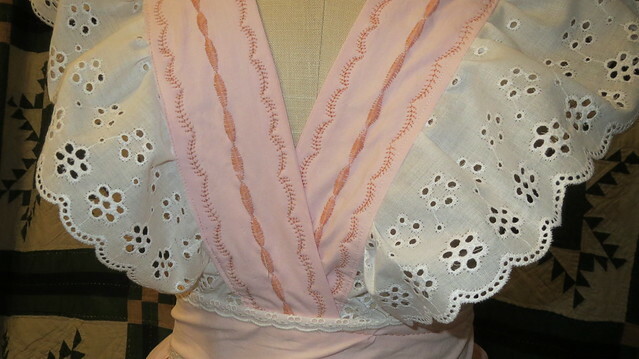 When I made this collar i thought some day in the future I will use it for an apron bib. Well that someday was last night. I added machine embroidery to the color to add some color to it to make it match a little better to the bottom part. The tie for this is more gross grain ribbon this time cream also saved from a gift I got. Nothing like costuming an entire play on a shoestring.